On Friday night, Jerry and I decided to have a date night since the kids would be gone for the evening. We were thinking about driving up to Detroit to go to dinner, but it was totally overwhelming trying to pick a place to go. I was reading Yelp reviews, which are usually people either ranting or raving about a place. It's also hard to choose a place to eat out when I'm on Weight Watchers--theoretically, I could order whatever I want and just estimate the PointsPlus in it; but I didn't want to use up all of my weekly PointsPlus on one meal. It's hard to make healthy AND enjoyable choices when dining out for pleasure, because most of the foods I love aren't very healthy at all. Eventually, we decided to nix the Detroit idea and just go to Panera (which is "safe" on Weight Watchers and I actually really love their food). I ordered the You Pick Two soup and salad: Cheddar Broccoli Soup and Asian Sesame Chicken Salad. With the 2 oz. baguette portion, it ended up being 17 PointsPlus--more than I typically spend on dinner, but it was so good and very filling. On Saturday afternoon, Eli had a horseback riding lesson. My mom got a deal on Groupon for two lessons, and that's what she gave Eli for his birthday. Jerry and I didn't have plans, so we tagged along with my mom (and brought Noah, too) to take Eli to his lesson. This was his first time on a horse, and he loved it! He looked so adorable. After his lesson, the kids came home and then went to the sleepover. Today, I could tell they were pretty tired from all the activities over a couple of days. Noah has been asking to go to Trader Joe's for a couple of months now, so we finally decided to go up to Ann Arbor (the nearest Trader Joe's) which is about 45 minutes away. The kids fell asleep in the car on the way. We didn't buy much at Trader Joe's. I wanted to buy pretty much all the sweets they had in the store, including the entire shelf of Cookie Butter, but I resisted. Eli got some snacks for his class tomorrow, because they're having a picnic outside, and Noah got what he wanted (some sour cream and onion corn puffs--that's why we drove 45 minutes to Trader Joe's! Hahaha). After that, we went to Barnes & Noble to browse around for a little while (we don't have a bookstore near us, so the kids love to go to them when we are out). I bought a couple of books about running. On the way home, we stopped at Redbox so that we could get the movie McFarland U.S.A. to watch tonight. My parents saw it and thought it was a really cute movie that I (and the kids) would like. So we're going to have a family movie night. We're supposed to have another thunderstorm, so it'll be a good evening for a movie! I really love Panera for a WW safe meal. I usually get the Thai Chicken Salad and Chicken noodle soup with an apple. I'm surprised they don't start making it when they see me coming lol. I am so glad the Strawberry Poppyseed Chicken salad is back at Bread Co! I love that place! 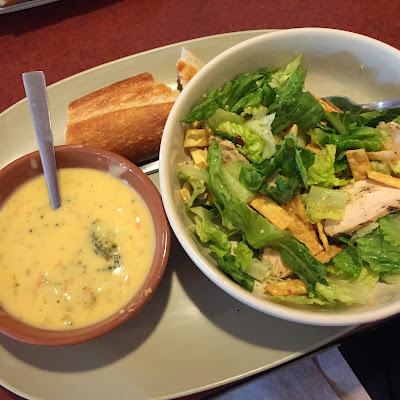 :) Here in the StL area we are still old school and Panera is still Bread Co.
Each day do you eat all 26 daily points? Yes, usually I eat about 35 PointsPlus per day. Twenty-six is the bare minimum that Weight Watchers allows. Sounds like a good weekend! That horse is TOTALLY giving you the side eye. Anonymous is fine, especially when you type in "Tanya H", so I can know who you are. But if you have a Google account (Gmail), you can sign in with that if you'd like :) Thanks for commenting! I saw that movie last week. I was great!! You will love it.